052.Jane Crayton – JavaMuseum 2010 – Celebrate! JanedaPain not ordinary, definitely not the same, or plain. JanedaPain makes you think, question who you are and what you are doing. The Pain she inflicts is knowledge, sight, and awareness. She is nontraditional, improvisational, uncontainable. about parenting. It contains personal video of my son that has been remixed with Vj software Keyworkx. The video was then organized with FlashMX to help pose questions which related to my parenting questions or questionable methods. The viewer must answer the questionable questions in order to proceed through the net_art piece. This will be an ongoing net_art piece, future sections will be added as more parenting questions arise. 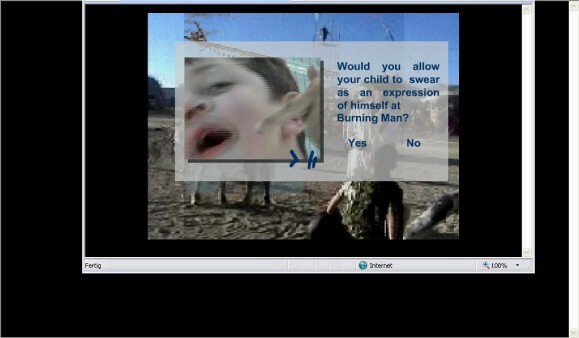 IPD was developed as a way for me to reflect on my parenting, and ended up being an interactive net_art piece in form. I started question my parenting as a result of taking my son, the legendary “Cuskid” to Burning Man 04′.